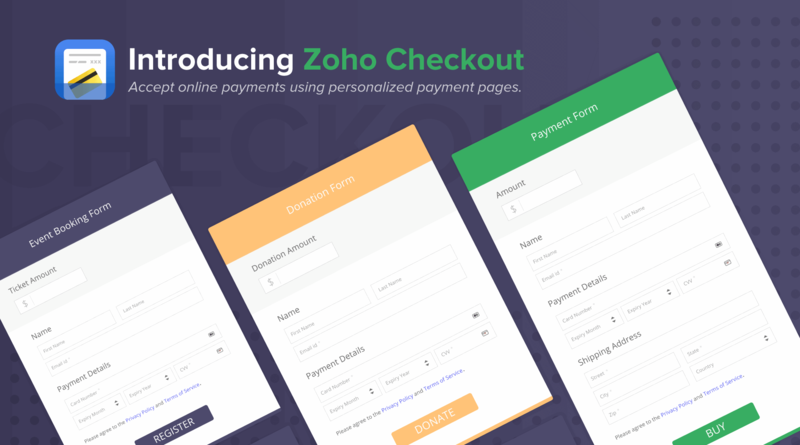 Zoho, today unveiled Zoho Checkout, a new-age application that allows businesses and freelancers to create customized and secure checkout pages to collect online payments, without the technical expertise traditionally required. In a time when Indian businesses are going cashless, Zoho Checkout delivers flexible payment options (one-time and recurring), real-time analytics to monitor monthly revenue, and customizable design to suit one’s business needs. Zoho Checkout is the latest addition to the Zoho Finance Suite, one of the most comprehensive cloud-based financial applications on the market today. Collect one time and recurring payments with ease: Zoho Checkout offers the ability to collect payments on an online platform where businesses can set up one-time or recurring payments, or allow customers to choose how much they will pay at checkout. It also provides users with the ability to embed the payment pages on a company website or share the URL via email or social media. No more compliance headaches: Freelancers and business owners can now accept card payments without having to worry about the complex compliance processes involved while collecting card details from their customers. Zoho Checkout ensures data security with Payment Card Industry Data Security Standard (PCI DSS) compliance and SSL encryption. Customization and Branding: Zoho Checkout allows businesses the option of customizing the payment platform to match the look and feel of a company’s brand. Zoho Checkout’s customization options include background colors, images, and logo, header and footer fields. Online selling made a lot easier: Indian businesses can use Zoho Checkout with Razorpay for accepting online payments. Zoho Checkout is also integrated with WePay and Stripe payment gateways for global customers. Handle payment failures effectively – In the event of a recurring payment failure, Zoho Checkout can automatically retry the customer’s credit card up to three times based on a configurable schedule, with a notification sent to the customer each time a retry fails. Marketing Extension —With support for MailChimp integration, effective email marketing goes hand in hand with Zoho Checkout. Users can connect a mailing list to a particular payment page so that customers using that page will automatically be added to your list and thereby extend your marketing reach. Real-time Analytics—Zoho Checkout offers businesses real-time insights into their revenues, failed payment tracking and follow-up customer communications.